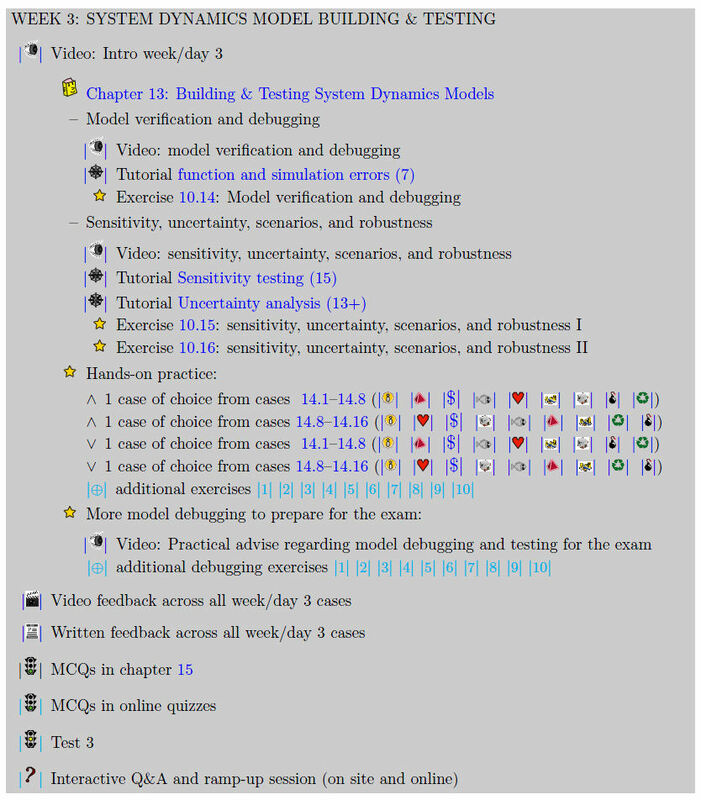 This SD101 track focuses on hands-on teaching participants how to make and use System Dynamics models. An open access e-book (Pruyt, E., 2013. 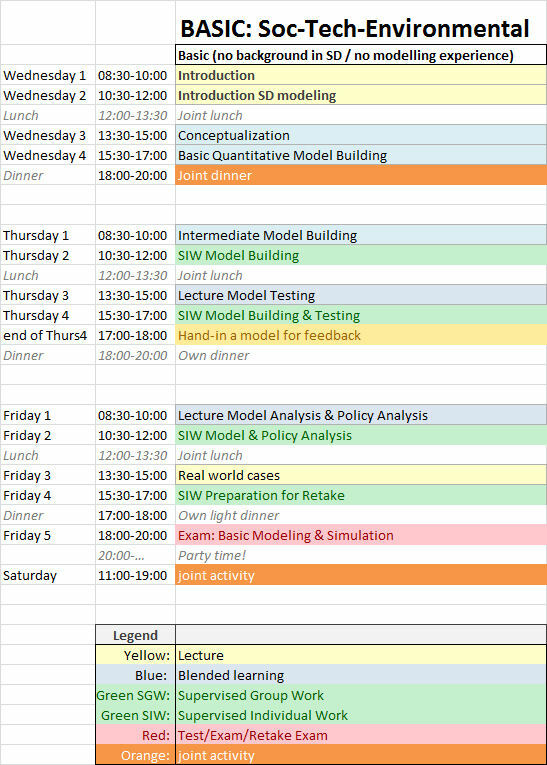 Small System Dynamics Models for Big Issues: Triple Jump towards Real-World Complexity. Delft: TU Delft Library. ISBN/EAN: 978-94-6186-195-5) will be used. The e-book can be downloaded here for free under Creative Commons license BY-NC-SA. Online materials are also available under the BY-NC-SA (i.e. 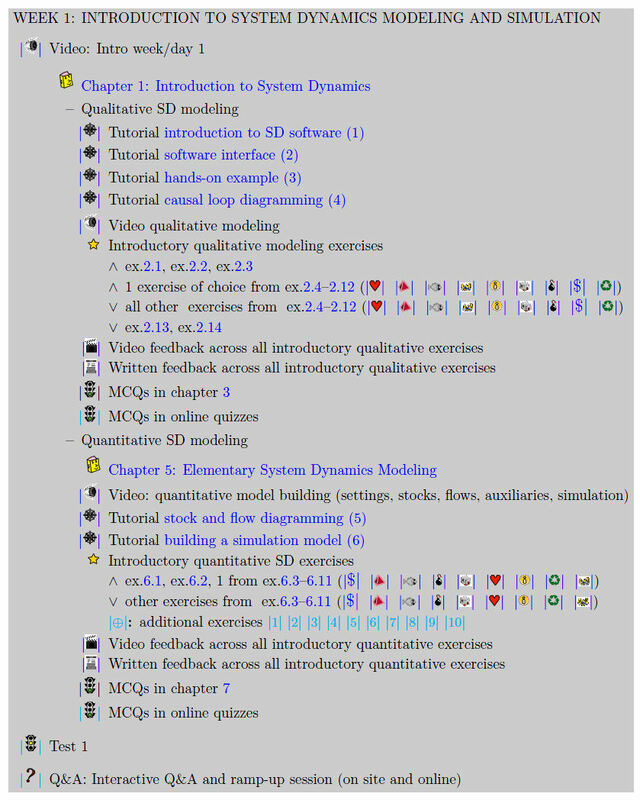 you can use and adapt the models, but you will need to refer properly to the e-book). Before getting started, it may also be useful to take the E-book Tour "How to use the e-book?". 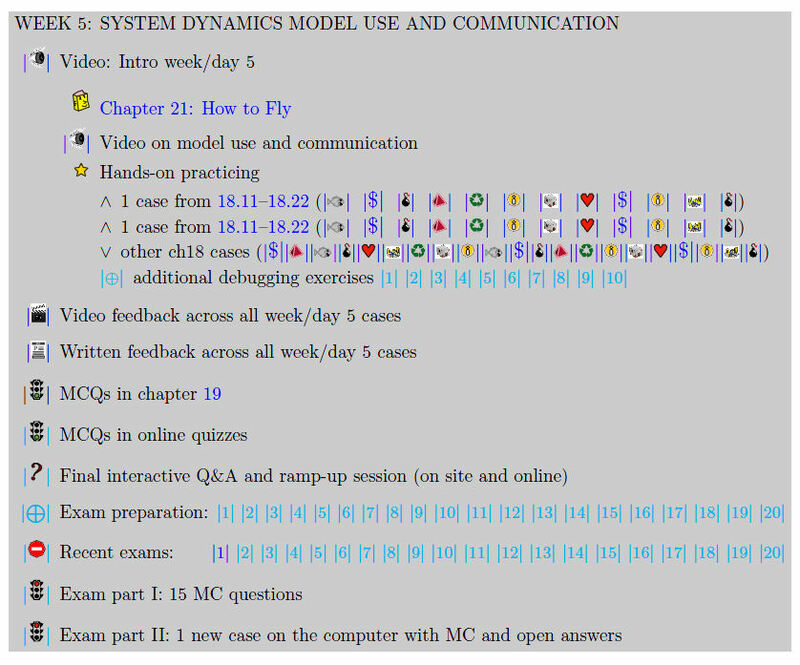 In class we will follow the generic learning path of the e-book, adapted to a three day schedule. That is, instead of figuring out things by yourself, you will be guided to the core by your lecturers. 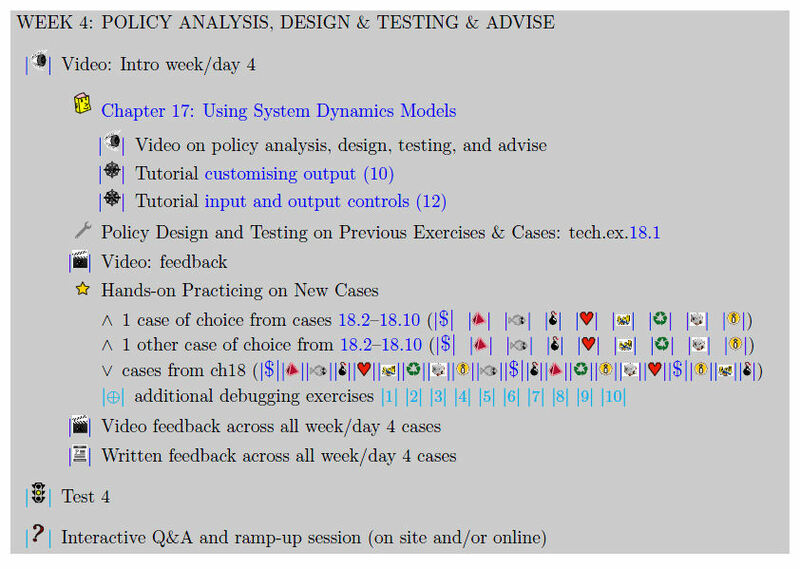 Note however that there are 9 theme-specific learning paths too (Health Policy, Epidemiology & Drugs (p.17), Environmental & Ecosystems Management (p.18), Resource Dynamics & Energy Transitions (p.19), Safety, Security & Risk (p.20), Policing & Public Order (p.21), Housing Policy & Urban Planning (p.22), Education & Innovation (p.23), Economics & Finance (p.24), Management & Organization (p.25)). Participants interested in just one theme can stick to their preferred theme. But all those with broader interest than just one or two application domains are strongly recommended to follow the generic learning path. More can be learned from modeling and simulating rather different cases. This track is particularly useful for participants that are new to System Dynamics or participants that	want to dust their SD skills. Softwares supported and used in this track include Vensim and Powersim, and to a lesser extent Stella. After this course, participants will have basic/intermediate SD skills: they will be able to make and use (relatively small and simple) SD models. Lecturers: Erik Pruyt & Len Malczynski, as well as Andrew Ford & George Papachristos. Fr5: EXAM: SHOW US YOU CAN DO IT! Homework before the summer school? This is a crash course. It may be useful to get started before the summer school: just download the e-book and get started. Maybe you can even get to the intermediate level before the summer school! © Copyright 2014, E. Pruyt. Created using Sphinx 1.0.8.